Farrar, Straus and Giroux (BYR), 9780374302023, 40pp. Alfie's mother wants to get rid of his favorite red shoes he's outgrown. So Alfie is running away. His mother points out that he might get thirsty on his trip, and she gives him a bottle of nice cold water. And a flashlight, in case it gets dark. Together, they pack everything Alfie might need. But once he is out in the wide world, Alfie discovers that some very important things can't be packed in bags. Kenneth M. Cadow is an art teacher who he lives in Norwich, Vermont. 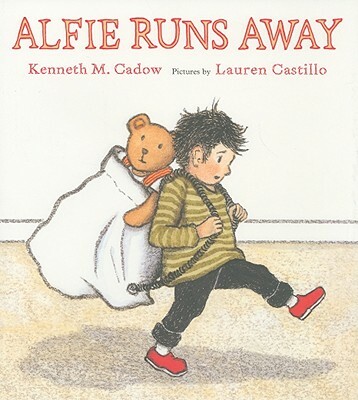 "Alfie Runs Away" is his first picture book. Lauren Castillo has illustrated several books, including "That's Papa's Way" by Kate Banks. She lives in Brooklyn, New York.